The Rays don’t seem to know what they want Matt Andriese to become. He’s had 7 appearances with the Rays this year, three not-very-good starts and 4 relief appearances. With the Bulls he’s had a relief appearance and this start, which began well, but didn’t end all that great, followed by Jordan Norberto, who was awful. The Bulls then traveled to Moosic, Pennsylvania for a re-match against the RailRiders. Dylan Floro had a brilliant start, his best of the year, but Andrew Bellatti, just back from Tampa Bay couldn’t hang on. Hak-Ju Lee has gone on the disabled list for an injury to his hand. I’ve missed all the details, but he was spiked on his glove hand and left the game Wednesday night. Leonardo Reginatto is back up from Montgomery and played last night. The team’s best hitter, Alexi Casilla, left game two on Tuesday evening and has not played since. First reported as a hamstring problem, but if someone’s got more current information, please add. Pitcher Everett Teaford went on the temporarily inactive list when Andrew Bellatti was added to the roster. The Game Score stat and the importance of starting pitching. 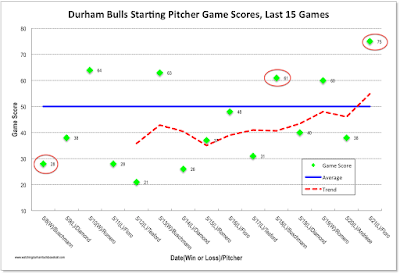 I’ve been reading up on Bill James’ “Game Score” stat recently and tracking the Bulls (and the Rays) starting pitchers. Game Score is a way of evaluating the performance of the starting pitcher. Overall the computation is pretty simple and fairly intuitive. And baseball seems to agree since it’s showing up in box scores. The game score concept expands on Major League Baseball’s official definition of a “quality start”. MLB defines a quality start as six or more innings pitched while allowing three or fewer earned runs. The game score system defines a quality start as a game score above 50. The advantage that the system has over the official definition is that it allows a statistician a better view of the degree of quality in a pitcher’s performance. Game scores can be quantified, and a pitcher’s performance tracked over time. It is also possible to compare different pitchers. If one averages a 60 and another averages 55, presumably the first pitcher has had a better season. Does it pass the “so what?” test? 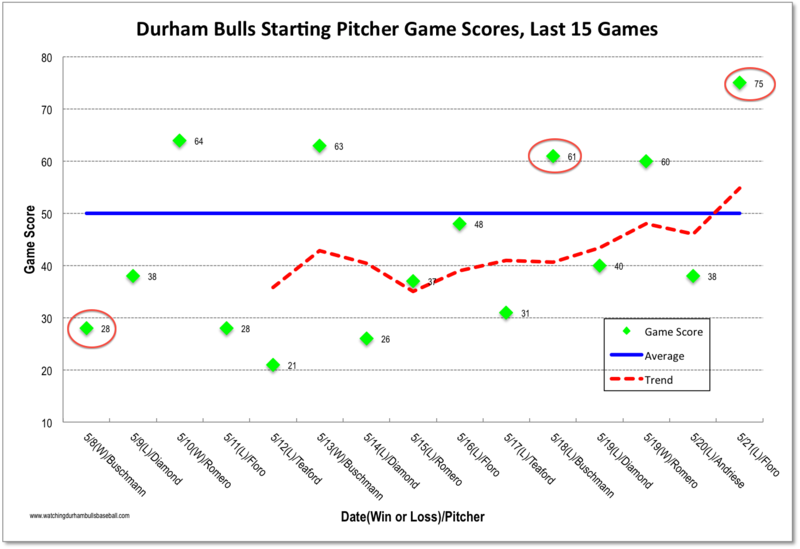 This chart shows the game scores of Bulls starting pitchers for the last 15 games. This has not been a good stretch for the Bulls, they’ve only won 4 games and they’ve lost 11. How does that track against starting pitcher performance? Pretty well. The circled scores are the only three anomalies of the 15. Otherwise it sure looks like an above average game score is associated with a team win (3 out of the 4 wins had above-50 game scores) and a low game score with a loss (9 out of 11 losses had below-50 scores). Please note that the wins and losses shown are team's wins and losses, not the pitcher's. It sure looks like a good part of this recent tough run can be attributed to starting pitching.